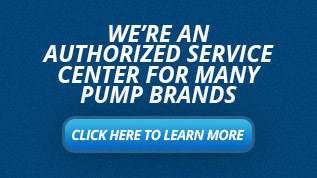 Finish Thompson Inc. is a pump manufacturer based out of Erie, Pennsylvania. From their beginning in 1951 as a designer and builder of custom decorating equipment, to their current position as a growing supplier of fluid transfer pumps and recycling systems for the fluid handling and environmental markets, Finish Thompson has proven to be a highly intuitive in projecting and reacting to changing market demands. Finish Thompson offers magnetic drive centrifugal pumps, sealed centrifugal pumps, drum pumps and air-operated double diaphragm pumps. Finish Thompson is a team of dedicated associates deeply committed to customer satisfaction and expansion of their technologies in the worldwide corrosive fluid handling markets. The UC (Ultrachem) series is an ANSI, ISO/DIN Dimensional ETFE-LINED magnetic drive centrifugal pump. Engineered for extreme reliability in the most extreme chemical processing applications. Constructed from tough ductile iron with Tefzel (ETFE) lining for superior corrosion resistance with 2 year manufacturer’s warranty. UC’s carbon bushing allows pump to run dry for several minutes without damage, but offers a Silicone Carbine bearing for abrasive or chemical compatibility. With strong neodymium magnets these pumps can handle specific gravities of over 1.8 and a maximum viscosity of over 200 cP. Stand out features of the UC series are the two-piece inner magnet and impeller offering, motor adapters to fit multiple frame sizes (NEMA 143 to 365) and multiple volute options for efficiencies (Modified Concentric Volute, Partial Splitter and Conventional Volute). 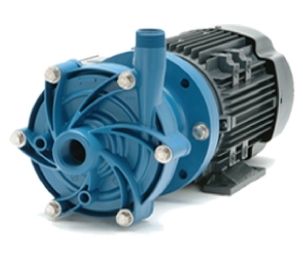 The DB series is a Magnetic Drive Centrifugal pump engineered for performance with state of the art software. With a unique bearing it runs dry for hours without damage. It is offered in Polypropylene or PVDF corrosion resistant construction. With strong neodymium magnets these pumps can handle specific gravities of over 1.8 and a maximum viscosity of over 150 cP. Other stand out features include a Five year warranty, CE certifcation and ATEX options available. 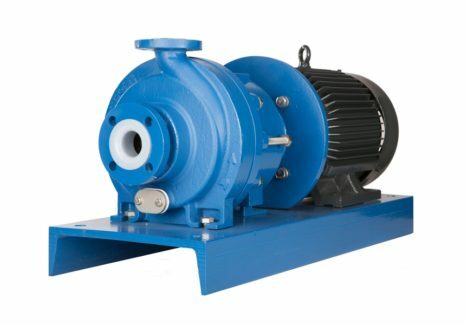 The SP series is a Magnetic Drive Self-Priming Centrifugal pump engineered for performance with state of the art software. Combining deep-lift suction capable of lifting fluids 25 feet and can prime 18 feet in less than 90 seconds. With a unique bearing it runs dry for hours without damage and with a one piece priming chamber design allowing for no seal replacement and no leaks. It is offered in Polypropylene or PVDF corrosion resistant construction. With strong neodymium magnets these pumps can handle specific gravities of over 1.8 and a maximum viscosity of over 150 cP. Other stand out features include a Five year warranty, CE certifcation and ATEX options available. MSKC Multistage Sealless Centrifugal Pump with magnetic coupling for leak-proof design. Multiple impeller diameters allow for increased pressure and hydraulic selection. Overall, this allows for increased head and pressures at low flow rates. It is offered in Polypropylene or PVDF corrosion resistant construction with multiple O-ring and bearing options to match chemical compatibility. 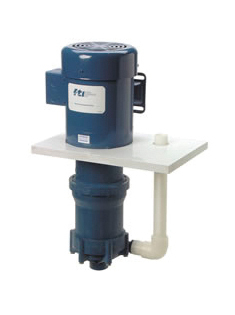 Finish Thompson carries a full line of mechanically sealed pumps to accompany their magnetic drive sealless pumps. 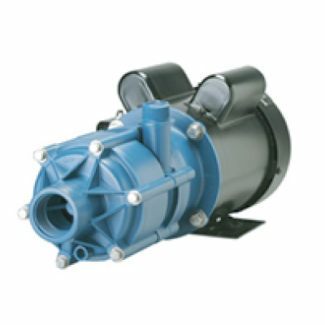 The AC Series pumps are metallic sealed centrifugal pumps, given a compact design, 316 stainless constructions and a variety of seal combinations. The sealed pumps 316 stainless steel construction provides chemical resistance with superior flammable fluid handling capabilities. ATEX Certified. AC series Pumps specifically constructed of FDA-compliant materials are ideal for food, beverage, pharmaceutical and cosmetic applications where 3A is not required. 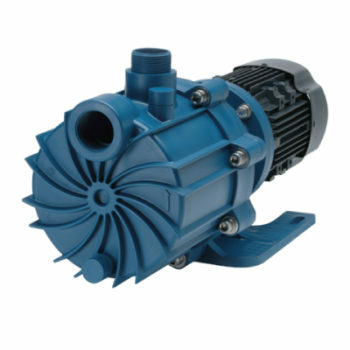 The GP series is second economical mechanically sealed plastic centrifugal pump. Non-metallic wetted components, corrosive chemical handling. Multiple seal types such as bellows, multi-spring, double seal carbon, including multiple materials such as ceramic, ni-resis, silicon carbide, and PTFE rotating and stationary faces with FKM, EPDM and Kalrez elastomers. Finish Thompson has a range of Vertical Pumps including the AK Series Stainless Steel Cantilevered pump, the AV Series Stainless Steel, the VKC Plastic Mag Drive Pump, and the MSVKC Series Multistage. 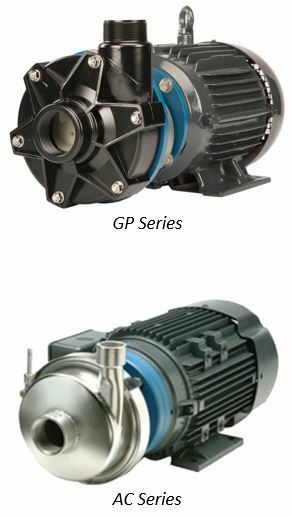 The AK series features a rugged, metallic sealed pump with compact design, optional stainless steel chemical resistances and no lower bushing for solids handling. The AV series features a variety of port sizes, seal combinations, impeller types and motor adapter sizes for application flexibility. The VKC series features elimination of aeration, foaming, and microbubbles, combined with process protection from motor components and fumes as well as inside or outside of tank mounting. The MSVKC pump is a multistage sealless vertical centrifugal pump that allows for increased head, lower power consumption, independent thrust bearings, and elimination of microbubbles. Finish Thompson features seven varying types of drum pumps. The PF – High Performance, EF – economy, TT – Mid-performance, the HVDP – High Viscosity, BT – High Viscosity, TM – Drum Mixer, and the TB – Mid-Performance. 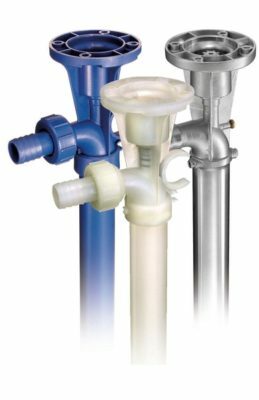 Each of these different drum pumps comes in varying materials from polypropylene, PVDF, 316SS. Handling fluids from high to light viscosity.